Article by Laura Sanchez Ramirez – Staff writer. Eileen Seitz art is the type of art that can easily get confused with reality. The bright colors of her paintings radiate a feeling of life and nature. The details in the scenes she portrays are the envy of those who, only for only a moment would like to be a part of the scenery. “Through my paintings I tell people not to be afraid”, says a positive Seitz. “There are alot of miracles that happen through my work.” A transplanted New Yorker Seitz can also be considered a daughter of the Tropics. Although she was born and raised in Manhattan she always looked beyond the skyline to find her art. It all started at the tender age of eight, when as a young girl, she grew an interest for drawing and painting. 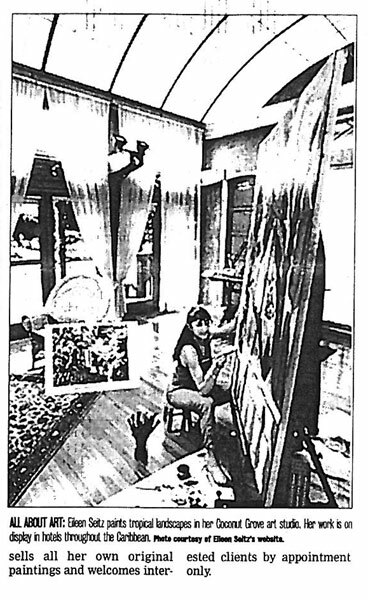 She was only 13 when she won her first place award for an oil painting in a New York City street fair. Seitz believes if people would notice nature around them more, then they would learn to flow more like nature does. She finally found nature in Key West and then in Miami with its tropical plants and warm weather. Seitz cannot tell you what the painting will convey until it is finished for she learns of its existence as her hand provides the last stroke. I never know when it will be finished. I am watching the painting through me on the canvas or paper the spirit telling me to put it there. But when its right it comes to a peaceful place. I know its time to put the brush down.” “My Future is to continue to paint and getting it around the world”. She has dreams of doing texile designs. “There are two people inside of me, one is one who studies Fine Art, and the other one who loves textile designs and patterns.” She is thinking of designing, draperies and linens” ” It would not be the same art as my tropical images, but instead graphic images. It will be patterns” Seitz is one who always lives her dreams. She is the type of woman who believes in rainbows. Sunshine is the seven colors of the Rainbow right?. If you merge all the colors together what do you get back? The light, the white light… that is God to me, the spirit that guides me , Seitz saids.